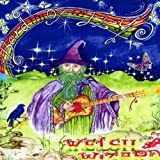 Welsh Wizard is an album of 15 songs by the Bard of Ely that was released on Alan Craw's DMMG label. There are many different music genres and it is an eclectic mix of songs spanning various stages in the Bard's musical career. He is backed by various different singers and musicians and the songs have different producers. Three have been remixed by Crum who is a former keyboard player for the legendary Hawkwind. The title track Welsh Wizard features and was produced by multi-instrumentalist singer-songwriter Madi. Electric lead by Madi and backing vocals by Bethan Frieze. It is semi-autobiographical because I have been called a "Welsh wizard" and I am interested in herbalism and the mystical side of life. I am very proud of my open-tuned guitar solo in this Folk-rock song.Welsh Wizard was remixed by Crum who added synth over-dubs. I was delighted that Crum, who has worked with the legendary Hawkwind, was willing to get involved by adding his talents to my music. King Arthur's Coming is a Country blues-style bit of fun that tells the story of King Arthur Pendragon, the titular leader of the Loyal Arthurian Warband druid order to which I happen to belong. It made up part of a set of songs recorded by and performed by the Travelling Court of Camelot, a band which I was fronting at the time. The song got used on a Meridian TV documentary about eccentrics and also a German ZDF programme about King Arthur. I played it acoustically on the BBC Wales magazine series The Slate . Priest of the Venusians opens with some synth sounds I created. The guitar riff is by my good friend Pixi. Welsh singer-songwriter Den is on backing vocals. 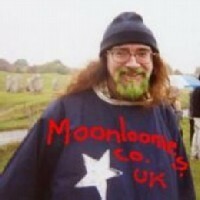 Priest of the Venusians has been compared with the B52s and The Rezillos. Pixi, myself, and a drummer called Aled Hughes had a band called the Venusian Priests for a while. We used to practice in my house. We had big plans at the time and used to open our sets by making the Venus symbol in the air. Ralf Friel of the German Pink Lemon label wanted to release the song as a single at one point but it never happened. If I Love You is the simple tale of when you find your partner has gone off with someone else. Its got a sort of New Wave or Pop-punk feel to it and a vocal by a girl singer who was in Cardiff at the time who called herself Lady Smoothie. She is one of many people I haven't a clue about where they are today. Starwoven Not Starcrossed was written in part by my American singer-songwriter and guitarist friend Chloe Moon Dancer. That was her stage name at the time. We wrote the words between us chatting on-line and I later came up with the tune. It was produced by Madi again and remixed by Crum. It is a bit rough around the edges but is a good song I feel. One To Three (Crum's mix) is a Country-style melody but lyrics that are unlike anything in that genre. It's a sort of flow-of-consciousness mystical love song. There is a second version of this song that was a demo recording but I decided to include it because it has some very soulful vocals by my former girlfriend Mandy, who sadly died of a heart attack just over a year ago. "There's too much hate in the world, there's too much pain, and too much violence in the world. We all need a real love and communication (yes, we do) - we all need a real love and communication." Jungle Love (with Get Rhythm) was recorded in one take in the living room of Jason Thomas the guitarist for Cardiff Rockabilly band Get Rhythm while his mother was out. We set everything up and just did it. Jason is playing his Gretsch. He mixed the song afterwards and I really like this one. An earlier version of this song was released on Meltdown The Album in 1989 and was called a "highlight of the album" by Paul Davies in Q magazine. Rubber Ducky was originally entitled Extracting the Latex from a Rubber Ducky . It was a song I came up with in a simplified form way back in the early '70s after smoking some Durban Poison with a friend. It was stupid and surreal with lines like "Picking out the bones of a herringbone jacket doesn't make a noise and doesn't make a racket," but people loved it and it soon gained a cult-following at my performances in Cardiff. I once managed to play the song at a Windsor Pop Festival and was on after Hawkwind. Amazingly I got an encore but I hated the attention the song got because I wanted to be a serious writer like Dylan. Years later it got written about in CJ Stone's Housing Benefit Hill column in The Guardian and in his book The Last of the Hippies. I recorded an updated version of the song with a backing band and it ended up on Take It To The Bridge Volume 3 , a compilation of Welsh bands, and from there it got played on the Welsh dramaY Ty ("The House") on the S4C TV channel. Ten of Cups is basically about not putting faith in the readings of fortune-tellers and means of divination, specifically the Tarot pack. Usually is a Dylanesque acoustic rant. "It's not unusual usually." Land of Our Fathers features backing vocals by Mandy again and some great grunge-style guitar by Pixi. It was part of the Travelling Court set and is an environmental protest rock song. It was released as part of the Mask EP on Pink Lemon Records from Germany. Citizen of Earth was just about being an individual and about resisting the Orwellian New World Order plan. It makes reference to the cult TV series The Prisoner in which Patrick McGoohan played Number Six. I sing: "A citizen of Earth is what I am not just another number in this land." Pixi and I once performed this live on Steve Johnson's show on Red Dragon FM radio. Reality Song was really a song about loneliness, not being understood and not fitting in but it's perhaps Greek or Russian-style melody inspired a lot of audience participation at gigs and Kossack-style dancing. "I'd really love to share with you some real reality." Ralf, what a wonderful surprise hearing from you here! Thank you for finding me!